Why did I wait so long to watch you??? This show was awesome! True, I think it would have been better as a 16 episode drama instead of a 21 episode drama… as it definitely suffered from a drag down towards the end… but who cares? It was fun. It was funny. It was romantic. It was pissy and playful and interesting and enjoyable. A young couple gets married, despite parental objections, only to have their marriage fall apart within the year. He can’t see her side of things, she can’t see his side of things, they are both 19 and fully immersed in their own perspectives. A few years pass, and both end up getting their medical degrees after the divorce. Fate brings them back together when they both get assigned the same intern positions, in the ER, and are forced to meet again. They’ve both grown up… but how long will it take them to realize it? Overall Rating – 8/10. Resuscitating a Relationship Requires Two Medical Degrees. More humor, musings, spoilers, and giggles follow…. First of all – I loved their scrubs. All the interns wore lilac scrubs, all the doctors wore dark purple. Everyone looked beautiful. It’s a surprisingly attractive color – complimenting skin tones and white lab coats. I don’t think I’ve ever noticed the scrubs in a show before, but literally every scene had me thinking, Wow, I like those lilac scrubs. I should get myself a pair… wonder where one buys those things, anyways? And how do they look on D cups, cause I’ll certainly never find out watching K-Dramas. What color hair dye was our female lead using, cause that color was flame-tastic! Speaking of hair – someone tip the hair stylist of our lady doctor, because long layers are the hardest to get right and her cosmetologist nailed it. Who knew our male lead was such a great singer? I actually secretly hate people that are good at karaoke… it’s supposed to be fun, so when someone steps up to the mic and turns it into an American Idol audition, I inwardly groan. How am I supposed to sing Love Shack, slurring the words in a bar, after someone just did a perfect Whitney Houston rendition? Assholes! But… this dude was amazing. He sang this sappy love song about wanting his woman back – which was hideously on the nose and clearly directed at his lady love he was pining after – and the fact that all the coworkers didn’t pick up on the obvious cues these two used to bang after that song makes me question their mental capacities. Maybe they were too busy falling in love with him. I think I fell in love with him a little bit. Dude can sing! I loved our main couple from the beginning and wanted them to get back together the entire show. The fact they could piss each other off to that degree just meant they hadn’t dealt with all their feelings. I dislike quite a few people, but no one gets me riled up in this world except for people I used to love and now I hate… because there’s still a little love in there. If there wasn’t, I wouldn’t have such a gut reaction to obsessively scowl and pick them apart mentally. I have always been in the camp that favors passion over comfort. Boring, easy, comfortable relationships? Ugh. Just give me death. Or a friend. Or a pet. The people who get parts of your brain and body fired up that are otherwise dormant? Those are your keepers. Your partners in crime. Your lovers and spouses and soulmates. I also loved our older doctors as a couple. They’d dated years before but split up because our male doc, Chief, is terrified of making a move in any direction whatsoever for fear it may be wrong. He’s super judgmental of everyone (single parents, divorcees) which makes it easier for him to justify his inertia and paranoia of the world. When he realizes that the people he cares about are in fact single parents and divorcees… he finally, slowly, has to let go of some of his body armor. By the end of the show he’s taken off his helmet, maybe. The rest of his body is fully encased, which is why there will be NO HUGS, no kisses, no moves in any direction towards what he wants except in his mind. Though at least he was finally able to say something and show with his face, now exposed, the emotion behind the words. Sigh. It will have to do. The poor over-protected fool. It’s easy to do, though, so I’m not unsympathetic. I think a lot of people live in their heads – and their entire lives can pass before them before they realize they forgot to actually love someone else. Oh well. The head is not a bad place to live, all things considered. At least, not in our comfortable society of air conditioned homes at the top of Maslow’s pyramids… we just filled in that middle layer of Love/Belonging with television and the internet. The side characters were charming and fun. All the doctors, nurses, interns and patients were amusing and well-rounded and gave a nice balance to the show. I especially enjoyed our lead female’s sister, the irresponsible aspiring rock star, and her love-lorn husband. 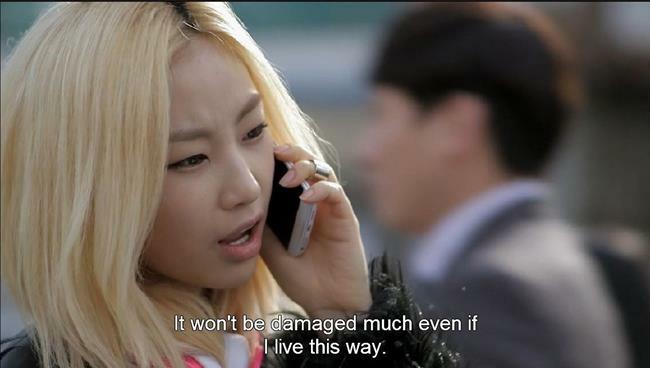 That gal looked fabulous with blonde hair, which is a feat in itself. Actually, I adored her husband! Who doesn’t love a dude who absolutely loves his baby? I grinned every time he showed up with his child hanging off him… the adorable Gook. And Gook was adorable. Babies kinda gross me out, but Gook was winning me over. I also really loved our lead male’s parents. The estranged father, who’d pretty much written his wife and child off entirely and gone into hiding – escaping into his own research and home and isolation with the comfort of a solitary bear returning to its cave. He seemed genuinely happy alone. His son and wife were like a dream he had… a recurring dream, that came back from time to time. The mother was your classic, insane k-drama mom – who wants what she wants for her son and no one else’s opinions on the matter mean a damn thing. She’s the throw acid in your face variety of evil mom, my favorite, just full tilt nutter. And of course, delightfully stylish. I admit, I felt it kind of dragged a little towards the end and lost momentum. But even so, each episode was still enjoyable. I generally hate hospital shows, but this one was just the right amount of nasty hospital stuff (a small amount), with the majority of the plot taking over – which was comedy, romance, drama, and more. There was a particularly gross scene were some dudes head injury literally squirted blood all over our lead female’s face – just… right into her eyes and mouth and nose… sooo ick. Clearly, I am not cut out of health care professions. Yet I still really liked this show. It was cute. 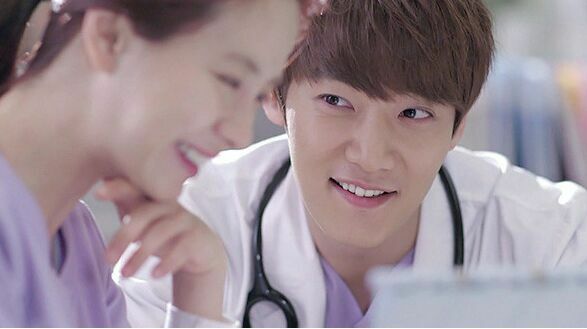 It was nice to see Choi Jin-Hyuk be so playful – he has a tendency to be very “low to the road” in most shows. 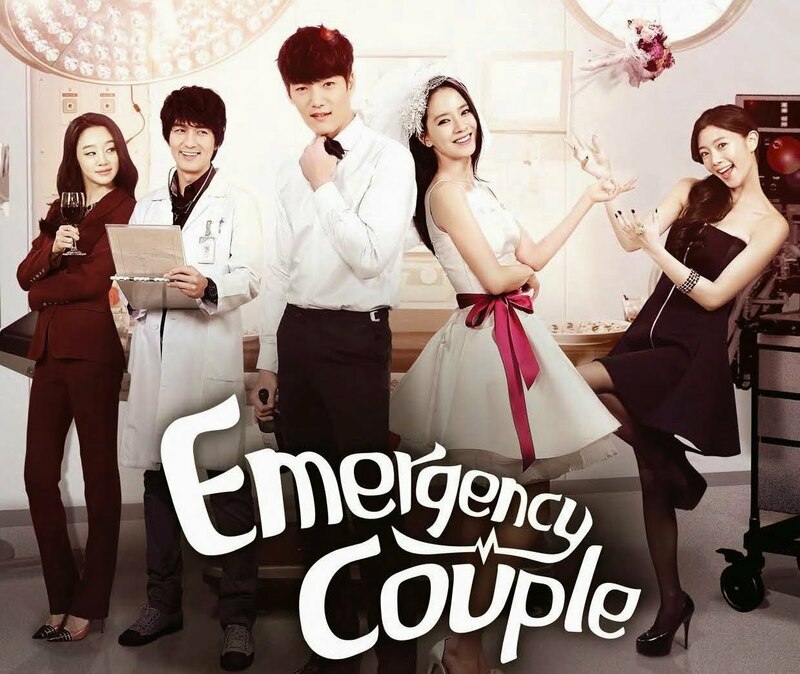 A quirky, romantic drama about second chances and growing up (this applies to both our main couples, the young interns and the older doctors). Check it out.